The historic Hotel Pennsylvania could soon become an office tower. MANHATTAN — It looks like lights out for Hotel Pennsylvania. The City Planning Commission voted unanimously Wednesday in favor of razing the storied hotel to make way for a new Vornado Realty office tower, despite fierce opposition by Community Board 5. If the decision is approved by the City Council, the new 1,200-foot 15 Penn Plaza tower will become one of the tallest buildings in the city and add nearly two million square feet of commercial floor space to midtown, according to an environmental impact statement filed with the commission. The project also includes the re-opening of an underground passageway under the south side of 33rd Street, which will connect the Sixth and Seventh Avenue subway lines as well as the PATH trains so commuters no longer have to transfer outside. Planning Commission Chair Amanda Burden said the property, directly across from Penn Station and Madison Square Garden, is an "ideal location for high density development." "At nearly 80,000 square feet, the site offers an opportunity for precisely the type of well-designed…office building that New York City needs to stay globally competitive," she said before casting a 'yea' vote. Vornado Realty Trust, which acquired full rights to the hotel in 1999, would not comment on the decision. But not everyone agrees that the new space will be a boon for the neighborhood. 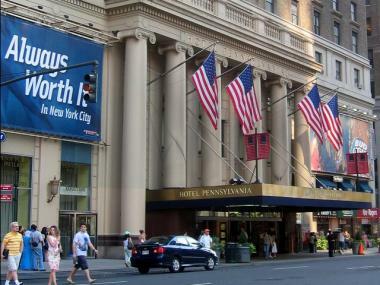 Midtown resident Gregory Jones, who has been fighting Vornado's plans for more than three years as the head of Save The Hotel Pennsylvania Foundation, said he was deeply saddened by the vote. "It's doing what the city has become famous for: Burying its history and tearing down buildings just for the sake of progress," he said. "My hope," he added, "is that the City Council will see the light." Community Board 5 sent a letter to the Chair of the Department of City Planning in April urging the committee to vote against the plan and warning that it "set a troubling precedent and a tipping point for future development in the area." But Borough President Scott Stringer overruled the Board, announcing his "conditional approval" of the project in May. The 22-story, 1,700-room hotel, which opened in 1919, was once one of the most famous in the world. In recent years, however, it has grown more famous for its discount prices.